OPINION: Does an auction of Central and South American treasures from the Virginia House conflict with the will of its owners? | Back Page | Style Weekly - Richmond, VA local news, arts, and events. Last week, a culturally involved Richmond couple was dining with friends from Philadelphia. "Why are you letting your local treasures get away?" the Pennsylvanians asked, both concerned and disbelieving that a public auction of 484 objects and books from Virginia House, a local house museum, was slated for April 9 at a prominent Philadelphia auction company. 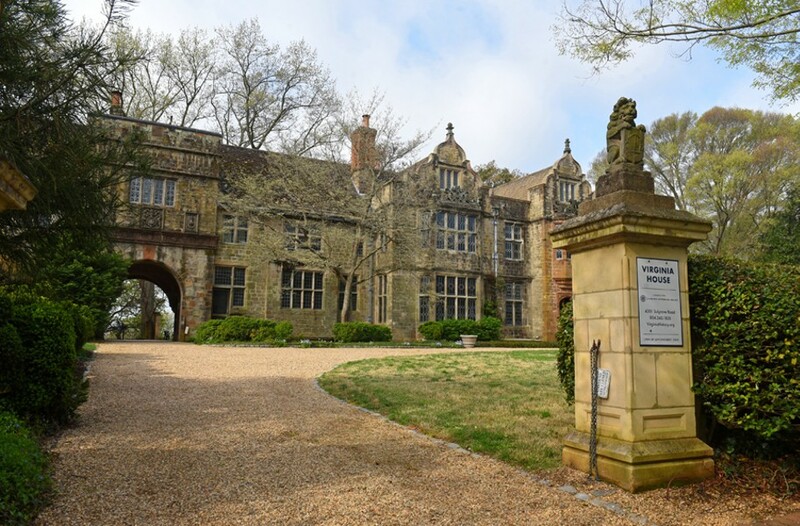 Virginia House, a Tudor-style mansion in Windsor Farms and a remarkable jewel in the holdings of the Virginia Museum of History and Culture, dates from 1100, 1560, or 1925, depending on how you do the math. You see, the former priory was dismantled stone-by-stone and beam-by-beam, melded with architectural elements salvaged from at least one other ancient English manse, and shipped to Richmond. Here, the remnants were reconfigured on a high bluff above the James River. William Lawrence Bottomley, the esteemed New York classical architect who worked frequently and well here early in the last century, added his own significant touches. Finally, landscape architect Charles Gillette designed acres of formal gardens that connected the impressive house to the rolling countryside, an achievement that still brightens and dazzles the spirits at all seasons. The ambitious and sophisticated patrons and residents of this romantic reclamation effort were Virginia and Alexander Weddell. Since he was a native Richmonder and the son of the pastor of St. John's Episcopal Church on Church Hill, he had been ingrained with a sense of history. She was whip smart and an heir to a significant St. Louis retail fortune. In the 1920s, the couple, who had no children, threw themselves into their house and garden project that met the highest standards for American domestic design. More Gatsbyesque than musty, the Weddells created an environment oozing with Old-World atmosphere, but also such modern amenities as heated floors in their personal living spaces. Significantly, Virginia Weddell also was socially conscious with concerns about how many far less-heeled Richmonders lived. She pioneered early efforts to raise the bar in developing affordable and public housing here through a number of private and public initiatives. The Weddells were also worldly. During the Franklin D. Roosevelt administration, and the build-up to World War II, he held significant ambassadorial posts in Spanish-speaking countries. These included Mexico, Argentina and Spain. At each locale the Weddells immersed themselves in the visual and practical arts, acquiring objects both antique and new, most with a Latin link. But what does an 18th-century Madonna, hand-crafted chair, or Mexican silverware have to do with Richmond treasures being auctioned north of the Mason-Dixon Line? While traveling during Christmas 1948, the Weddells were killed in a railroad accident. In their wills, they left not only their house, but its contents to the Virginia Historical Society, the parent organization of the Virginia Museum of History and Culture. The ambassador was specific: "I give and bequeath to Virginia Historical Society all books, manuscripts, furniture, house furnishings, portraits, tapestries and other works of art belonging to me in whole or part at the time of my death and constituting a part of the equipment of Virginia House, including silverware, china, glass and household linen, and all house equipment, utensils and garden tools, to be held by said Society and used by it in the use of the Virginia House. …"
Did the Weddells want the historical society to maintain the home in perpetuity as the director's home? The couple also provided a generous endowment of $100,000 for its maintenance. But no one has lived there; it has remained for 70 years an off-the-radar, 20th century King Tut's tomb. It is kept alive however, as a setting for occasional functions, a venue for civic and cultural group meetings, private events, and popularly, as the springtime setting for a garden party for society members. Members of Richmond's deep state of culture were shocked — and some outraged — to learn that objects from the house were being nibbled way for scratch to be reinvested in maintaining its place. The society says objects sold don't fit the organization's mission. This is disingenuous: With such a dizzyingly broad household collection, how would one begin to determine what does, and does not fit, the society's mission? Granted, the museum, a private organization, has not stated clearly its plans for the old house and its contents. As its defense, the group says that auctioned artifacts came from the basement. Well yeah, it would be an obvious place to store things there, even some of the best things. But a number of other prominent paintings and tapestries were removed from well-traveled spaces and put on the block. Cherry picking largely unknown objects for auction is not worth the bad publicity and loss of trust in the venerable organization. Freemans, the Philadelphia auction house, marketed its sale as "Across Continents: the Weddells' Connection to Central and South America." And herein lays an answer to how the museum can communicate the story of the Weddells, their home, and all its contents, to the forefront of its mission. Virginia, and American history by extension, did not begin and end at English-centric Jamestown or Williamsburg. Currently, Mexico and South American countries are in the daily headlines. Virginia's population is becoming increasingly Hispanic. This Spanish-centric collection contains treasures and artifacts that should be mined for fresh exhibitions, to please popular audiences as well as the toughest connoisseur. The Virginia Museum of History and Culture can broadcast widely that the Old Dominion, and its programs, aren't one-note. And to Latino audiences, it can show that reserves of Spanish-related material — albeit much dealing with tough and disturbing political chapters — should be examined in central Virginia. Style senior contributing editor Edwin Slipek writes regularly on architecture and local history.